I just started out using PHP storm and am not that familiar with Apache so bear with me. 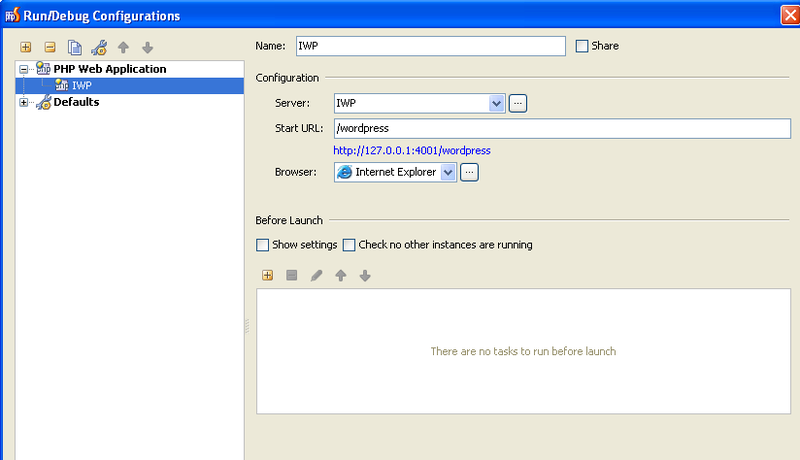 I am using Instant Wordpress to develop Wordpress sites on my desktop. Instant Wordpress comes with MySQL and Apache built in so you just start it up and it creates a Wordpress instance at http://127.0.0.1:4001/wordpress. I am using PHP Storm to edit the files in my custom theme folder in the Wordpress installation. I'm trying to get XDebug to work for debugging. I have set up the Server in PHP Storm to point to 127.0.0.1 port 4001 and created a Run configuration in PHP Storm, called IWP, using PHP Web Application. I have hooked the run configuration in to the server which I have already set up. I have attached screenshots of my Project settings - Servers and Deployment Mapping tab. Also my run configuration setting. c) Activate "Run | Start Listen PHP Debug Connections"
Let me know how you are doing.